Structures and authority have never gone down well with you and today you may find yourself just having to grin and bear these two things in your life. Although if you were smart about it you could actually decide to use this to your advantage. Is there anything you need to think through? Have a plan for or need to call in some favors in helping you get ahead. While this card can refer to rigid authority and religious dogma, we meet a somewhat different type of Hierophant in this card. The image on this card is from the famous series of frescoes by Simone Martini, depicting eight saints at San Francesco, Assisi. 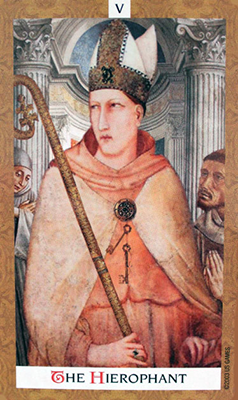 This is St. Louis of Toulouse, who was taken hostage as a child and raised by Franciscan friars. He later renounced his royal title in favor of his younger brother, and took the Franciscan vows of poverty, chastity, and obedience. He was renowned for holiness, sacrifice and miracles. Notice the two keys hanging over his heart. This implies tackling a problem you’re having and coming from your heart in how you handle it. You may well find that these keys open the door for you to success, bypassing a lot of that hard work spoken of above. The card used for today’s Tarot Scope is part of the Golden Tarot series by Kat Black, distributed by U.S. Games, Inc. For more information on the Golden Tarot check out and “like” Kat Black’s Facebook Fan page.